What Medical Costs Are Tax Deductible for Retirees? You've finally reached that milestone. You've retired, but now your medical expenses are increasing—that's a natural result of aging. It's estimated that the average couple over age 65 will spend about $280,000 on health care in retirement in 2018, and that figure increases by about 2 percent each year. A silver lining might be found in a potential income tax deduction for these extra expenses. Most medical and dental expenses are deductible. The medical expense tax deduction covers the cost of insurance premiums, including Medicare, and even long-term care insurance premiums. Virtually all medically necessary costs prescribed by a physician are tax deductible. This means that if your doctor told you to add a humidifier to your home's heating and air-conditioning system to relieve your chronic breathing problems, the device could be at least partially deductible. Travel expenses to and from medical treatments are deductible. The mileage deduction is 18 cents per mile in the 2018 tax year. The cost of in-home care can be deducted if you're chronically ill and the care is prescribed by your doctor. Deductible uninsured medical costs can include everything from an extra pair of eyeglasses to an order of contact lenses, dentures, hearing aids, or prosthetic limbs. Substance abuse treatment costs, such as alcohol and drug rehabilitation programs, are potential itemized deductions, as is laser vision corrective surgery. The primary exclusions are non-prescription, over-the-counter drugs and expenses which are more cosmetic in nature, like teeth whitening. But supplements are deductible if they're recommended by a physician for a specific condition. You can't deduct the costs of toiletries, elective procedures that are not required to improve your health...and no, your country club membership isn't deductible either, even if your doctor told you to walk more and you get a lot of healthy exercise out on the green. You can never deduct any payment you make which is reimbursed or paid for by insurance. And premium payments to your insurance company must be made from after-tax income. You must itemize to claim a medical expense deduction. This means the total of your itemized deductions should exceed the standard deduction for your filing status or you'll actually be paying more in taxes. This can often be a challenge for older Americans because the standard deduction increases when you hit age 65 and/or if you're blind. This can make it harder to reach that threshold. Additionally, standard deductions have increased dramatically in 2018, thanks to the Tax Cuts and Jobs Act (TCJA). They're now set at $12,000 for single filers and those who are married but file separate returns, $18,000 for head of household filers, and $24,000 for married taxpayers filing joint returns, as well as qualifying widow(er)s.
You'd need a lot of medical expenses to exceed these amounts, but you can include other itemized deductions to potentially add up to more than your standard deduction. You can compute the total of your itemized deductions using Schedule A, which must be submitted with your tax return when you file it. 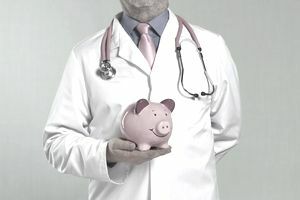 You can only deduct the portion of your medical expenses that exceed 7.5 percent of your adjusted gross income (AGI), although this rule has shifted and changed a bit over the years. The threshold was set at 7.5 percent until 2013 when Congress increased it to 10 percent—but not for those age 65 or older, at least not immediately. Seniors could continue to deduct medical expenses that exceed just 7.5 percent of their AGIs through the end of 2016. Then they, too, were supposed to be subject to the 10 percent rule beginning on January 1, 2017. Then the TCJA went into effect in January 2018. This tax law retroactively reset the threshold to 7.5 percent for tax year 2017 through tax year 2018 for everyone, regardless of age. Unfortunately, the threshold is set to ratchet back up to 10 percent in 2019. Here's where your presumably lower income during retirement is a potential asset. If your AGI is lower, so is the dollar threshold that your medical expenses must exceed in order to provide you with a tax benefit. For example, you'd need expenses in excess of $4,125 on an AGI of $55,000, but you'd need at least $5,625 in expenses if your AGI was $75,000. And when the 10 percent threshold comes back in 2019? You'll need $5,500 or $7,500 respectively. Only about one-third of all taxpayers historically itemized deductions before the significant increase in standard deductions became effective in 2018, but there are situations in which the medical expense deduction can be a helpful way to reduce your taxes. If you're in retirement and your taxable income has lowered your AGI to a point where it allows you to take this itemized deduction, start adding up those medical bills and receipts. Publication 502 issued by the IRS further details the medical and dental expenses that can be claimed on Schedule A.